The Electron Microscope (E.M) Unit functions as an independent body of the Health Sciences Centre, providing services to various departments of the Health Sciences Centre in the areas of teaching and research. 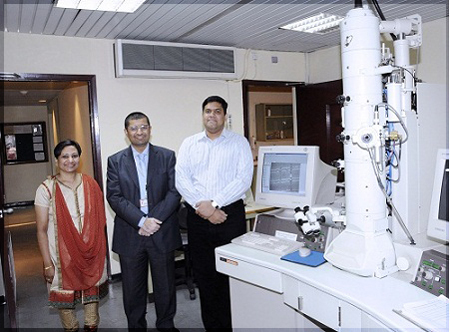 In addition, the Electron Microscope Unit provides laboratory diagnostic services. For diagnostic services, specimens are received through the Department of Pathology. The unit is equipped with some of the latest, highly sophisticated and expensive electron microscopes, ultra-microtomes, image analysis system and other such equipment that are required for meeting the research and diagnostic needs of the members of the Health Sciences Center.